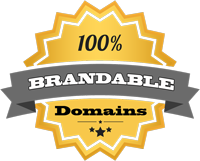 This pronounceable domain makes a great acronym for a longer title, because of its premium Western letters. The .tv extension is used more and more often as buyers realize they can acquire valuable short names that are simply not within one’s budget in .com. The extension is also a great one for sites with a great deal of graphics and photo content.